Amsterdam-based Latoya van der Meeren is the latest photographer who’s beautifully raw images have got us swiping, saving and coming back for more. Her work is both personal and intimate - avoiding ‘typical’ subjects and instead focusing on tender moments, simplicity, nature and family. As a new mother, Latoya’s photography has been on a journey in the last year or so, from capturing life on the road to documenting her first pregnancy, her daughter and the mother muses around her. We love her honest snapshots of everyday life - whether that’s a crumpled linen bed sheet blowing in the breeze or her friend stretched out on the sofa breastfeeding her baby - Latoya has a knack of chronicling them in an effortless style that’s full of depth. We grabbed a moment with the busy mum and photographer to chat pictures, pregnancy and life in Amsterdam. I’ve had an interest in images for as long as I can remember. When I was 22, I started a blog that was part diary, part images I found. It wasn’t until I met my first muse Anna that I started photographing - I was 26 years old at the time. I bought this old analogue camera at Waterloo flea market and just started shooting and learning as I went. I’ve never stopped since and really felt like this was exactly what my heart had been missing. As your series ‘Diaries’ implies, you have a very relaxed and uncontrived style. Documenting tender moments and snapshots of everyday life. Why do you choose to shoot in this way? The writer Anaïs Nin wrote that “We write to taste life twice, in the moment, and in retrospection”, for me it’s the same with photography. The pictures are my diary, I write in one too. I shoot to remind myself of a story I don’t want to forget or I don’t want to let go of. In a way it’s holding onto things - whether that be a moment shared with someone, or the way the light hit the linen sheets. If you look carefully, you can see beauty in just about everything. My photography is quotidian: it’s spontaneous, yet also intentional. I know exactly what emotion I want to capture when I click. Even though it is often what is not in the picture that I remember and value the most. Having worked with numerous brands and media titles from Dove to VICE, what has been your favourite project to date? In 2015 and 2016 I worked on a series about scars, and how a person’s healing process happens mostly from within. I published these stories and photographs in a book named “Remainders”. Having these people open up and confide in me felt extraordinary and is something that has changed the way I work. Also in 2015 I joined the band Death Alley on the road for a story on VICE which (seeing as I must have watched the movie Almost Famous at least 76 times) was a dream come true. We slept in squat houses and backstage bunkbeds and I loved every minute of it and the feeling of freedom it gave me. I still feel it when I look back at those photographs. Amsterdam is often cited as one of the top places in Europe to live in with a good quality of life. What makes this city home to you? Almost everybody I love is here, Amsterdam is my home. This city can get crowded and loud and hasty but there is nothing like coming back from a trip and cycling over the canals on a quiet night. Or any time really. Amsterdam has her own kind of magic. I didn’t think about documenting my pregnancy any more then I did my days before - it happened naturally. The first couple of months I didn’t feel that inspired to create anything, that was a weird and uncomfortable awareness because I feared it might never return, but after about 3 months I just picked up my camera, set it up on the table and used a self-timer. The feeling came back. My pregnancy made me look at myself and my body in a much kinder way. Through my self-portraits I felt like I was getting to know this new person that I was becoming. Looking back, I see a clear change in my photographs. I shot most of my favourite images in those 9 months. Now coming up to one year since becoming a mother, do you feel you have changed as a person? California-based Dani Kenney is a mother and a natural skin and body care guru. 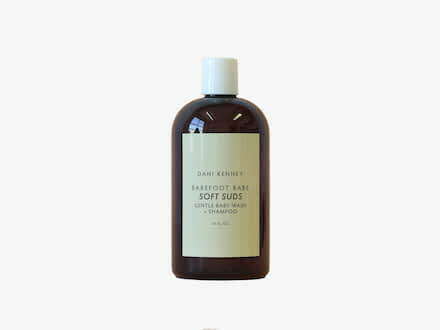 Her Soft Suds shampoo for babies is gentle, nourishing and chemical-free - ideal for little ones. This intensive dry skin treatment is known for its 100% natural moisturising properties and proven capability of helping sufferers of psoriasis, dermatitis and eczema, as well as for babies from the age of 6 weeks upwards.